Apartment homes will be imbued with historic character, including exposed brick walls, heavy-timber ceilings and expansive windows with stunning views of downtown Milwaukee and the skyline. Fortress features a wide array of community amenities to match the interests of all residents. Fortress is located adjacent to the Historic Brewers Hill neighborhood – a thriving community dedicated to the excitement of diverse, urban living. The iconic tower of Fortress has been converted into a 1,589-square-foot, three-story penthouse featuring unrivaled views of the Milwaukee skyline. 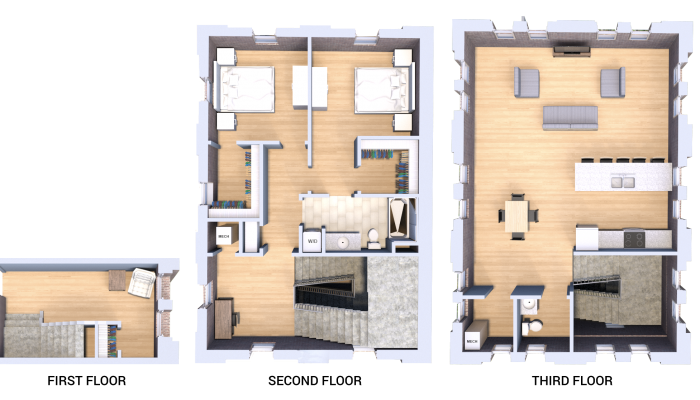 Enjoy two bedrooms, two bathrooms, and multiple den / seating areas. There’s nothing else like it. If you have any questions or wondering if any reasonable requests could be accommodated, don’t hesitate to contact us. Utilities: Tenant is responsible for all utilities. Pet Policy: Up to two dogs or one dog and two cats are allowed per apartment. Dogs are not restricted by breed or weight limitations. Pet fees are $25 per month per pet. Fish tanks are permitted up to 20 gallons. Other caged animals will be considered. No ferrets, rabbits or birds.